A mechanic needs to be a part-time electrician, semipro fuel system specialist, self taught millwright, amateur machinist, and back-bench welder. But what he or she is supposed to do is to rebuild engines, the subject of this section. Block assemblies can be repaired, overhauled, or rebuilt (FIG. 1). Spot repairs are either triggered by local failure (e.g., a sticking oil pressure relief valve or a noisy valve train bearing) or by a need to extract a few more hours from a worn-out engine. Many a poor mechanic has replaced an oil pump more out of hope than conviction. While an overhaul is also an exercise in parts replacement, the scope is wider and usually occasioned by moderate cylinder and crankshaft-bearing wear. At the mini mum, an overhaul entails grinding the valves and replacing piston rings and bearing inserts and whatever gaskets have been disturbed. The effort might extend to a new oil pump, timing and accessory drive parts, oil seals, cylinder liners (when easily accessible), together with new piston, ring, and wrist pin sets. Because the block and crank shaft remain in place, machine work is necessarily limited to the cylinder head. In the classic sense, rebuilding an engine means the restoration of every frictional surface to its original dimension, alignment, and finish. The engine should theoretically be as good as new, or even better than new in the sense that used castings tend to hold dimension better than "green" parts. (Repeated heating and cooling cycles relieve stresses introduced during the casting process.) In addition, an older engine might benefit from late-production parts. Although some mechanics would disagree, the rebuilding process cannot repeal the law of entropy. A competently rebuilt engine will be durable over the long run and will be reasonably reliable in the short term, but it won’t quite match the factory norms. Subsurface flaws won’t be detected. Metal lost to water jacket corrosion is irretrievably lost. Nor can original deck height, timing gear mesh, main bearing cap height, and camshaft geometry be achieved in any commercially practical sense. And the potential for error, on the part of both the machinist and the assembler, affects reliability. More often than not, a freshly rebuilt engine will experience "teething" difficulties. On the other hand, the cost should not exceed half of the replacement cost, and engine life will be nearly doubled. Traditionally, the work is divided among operator mechanics, who remove the engine from, its mounts, dismantle it, and consign the components to a machinist for inspection and refurbishing. The machinist might supply some or all of the replacement parts, which, together with the reworked parts, are returned to the mechanics for final assembly. FIG. 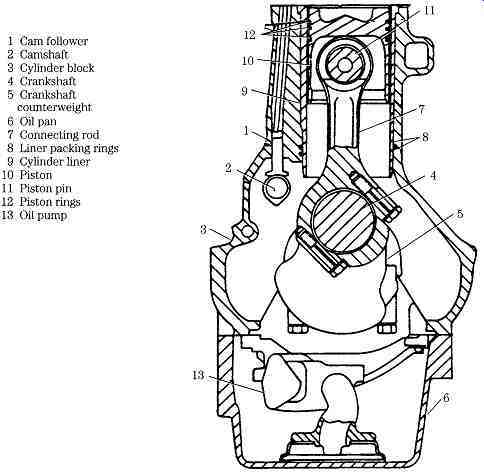 1 Sectional view of Deere 6076 block assembly and nomenclature. This approach organizes the work around specialists' skills, keeps the critical business of assembly in-house (where it probably belongs), and minimizes out-of-pocket expenses. One working mechanic-not the shop foreman-should have undiluted responsibility for the job, a responsibility that includes new and refurbished parts quality control (QC), assembly, installation, and start-up. Engine machine work is an art like gunsmithing or watch repair in the sense that proficiency comes slowly, through years of patient application. In my anachronistic opinion, the best work comes out of small shops, where Model T crankshafts stand in racks, waiting for customers that never come, and the coffee pot hasn't been cleaned since 1940. These shops, in short, are places where a mill means a Bridgeport, a grinder is a Landis, and the lathes were made in South Bend.